Quick post! I’m not going to pretend to be cool. When it comes to events like the solar eclipse, the conjunction of planets Venus and Jupiter, or the few good meteor showers we’ve had in the Northern Hemisphere in 2017, I turn into an astronomy fanboy. I’m not a super technical person, but I’ll read up, obsess, and gab to my co-workers about how cool these things are. When it comes down to it, I’m sort of like that annoying 90s kid back in first grade who liked Power Rangers. There he goes, attempting to roundhouse kick off the playground equipment again. Yes, that was me. It still is—minus the campy martial arts TV show. Last night the Geminids put on a fantastic display of shooting stars. My wife and I counted sixty-six meteors (and among them were more than a few fireballs) in a clear sky out in frigid December weather. Every time one streaked across the sky, we let out a “Wow!” as the vapor from our breath steamed in the night air. We stayed out doors under forty-five minutes, opting to warm up next to our wood stove before we went to bed. 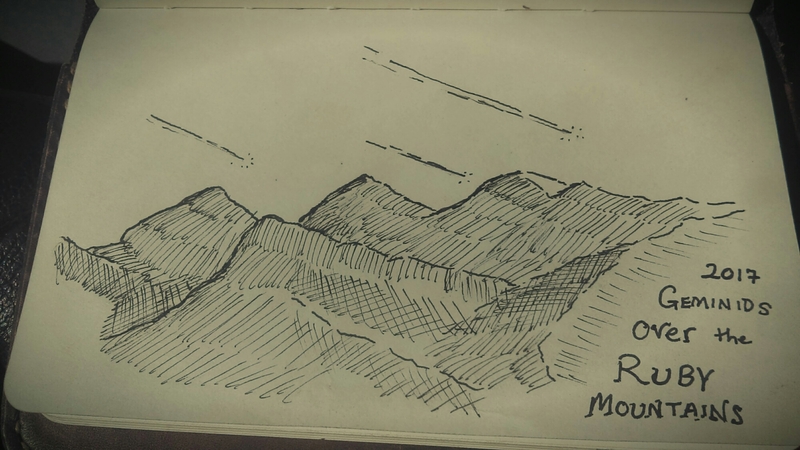 I don’t have a sweet camera set-up so here’s a sketch from my pocket notebook.